Adeline Viola (Conry) Susa was the fourth child born to Robert and Elizabeth (Dowd) Conry on June 23, 1919 in Oberlin, Kansas. Shortly after her birth, the family moved to St. Francis, Kansas where she grew up. She graduated from St. Francis High School in 1937 and went to work for a year at the local Ben Franklin store. The following year, she and her sister left for Fort Hays State College to pursue a teaching certificate. 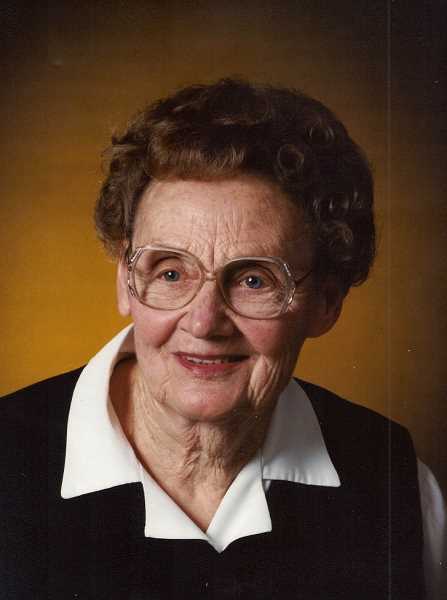 In 1940, she received her "Life Certificate" from Fort Hays and began what would be a teaching career of 40 years. Her fi rst years of teaching were in a one room school house in rural Kansas. Adeline moved to Oregon in 1948 and immediately secured a teaching job in Mt. Angel. The next spring, she met Ervin Susa and they were married on her birthday in 1951. In 1953, she completed her BS in Elementary Education from Mt. Angel Women's College. The couple would have four children and Adeline focused her attention on raising them. In 1966, she returned to the classroom in Mt. Angel and retired at age 70 in 1989. She was active in her parish at St. Luke, in study groups and as a Eucharistic Minister. Her husband, Ervin, died in 1994. Adeline busied herself with canning, needlepoint and the growing family of grandchildren. Adeline leaves behind her children, Mary Neil (Mark), Gwen Lewis (Bob), Ron Susa (Connie), Bev Heller (Jeff); 13 grandchildren; and nine great-grandchildren. She was pre- deceased by her grandson, David Heller. In lieu of fl owers, the family suggests memorials to the charities closest to her heart; St. Luke Cemetery, the David Heller Foundation and Candlelighter's for Children with Cancer.